I’ve been sat here staring at a blank page now for what seems like an eternity. I’ve been looking forward to writing a seafood picnic ideas article for so long now it’s strange that now the time has arrived I’m stuck. Not because of a lack of ideas, quite the opposite, I’ve mentally run through a list of several great seafood dishes. The problem being that every time I’m about to strike the first letter on the keyboard an even better meal pops into my head. 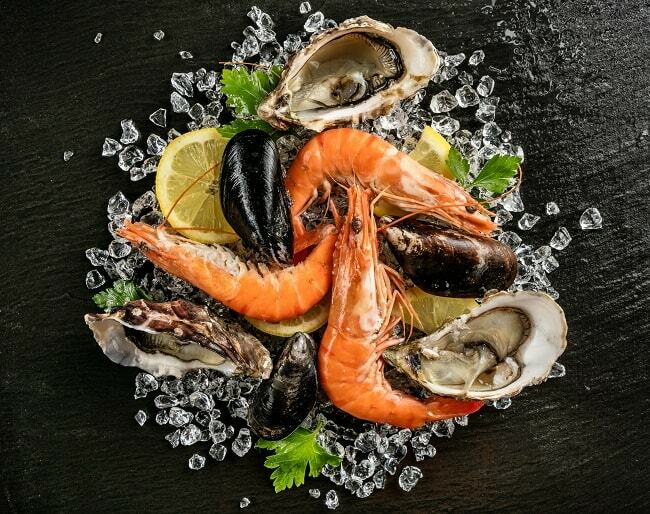 Of course seafood can be eaten hot, but what makes it fantastic picnic food is that it’s often just as good, if not better when served cold or raw (and for the fearless amongst you certain seafood can be eaten alive). So given the vast array of different fish and crustaceans available it feels like sacrilege to pick just a few. Alas, I must muddle on, albeit with the fear I’ll be coming back to update these seafood picnic ideas everytime I eat a new seafood dish. There’s surely no better place to start your seafood picnic other than a dish that is beauty personified – A cold seafood platter. Platters of all descriptions are great picnic staples as they are finger foods made for sharing. You can find some tasty recipes online, but the beauty of platters is there are no hard and fast rules, and a cold seafood platter is no different. If the seafood ingredients can be eaten cold, then add it. This can be lobster, crab, shrimp, prawns, salmon, oysters… I think you get the idea. But don’t hold back, you don’t have to just add seafood, a number of salads and veg complement seafood platters. So add lettuce, avocado, lemons, etc. And then top it off by offering an assortment of sauces or dips. I love a sweet chili dip with prawns, mustard with crab and guacamole with salmon. I’m sure you have your own favorites, just don’t feel afraid to experiment, that’s the beauty of platters. Salads used to be the forgotten item on a picnic menu but has grown massively in popularity over the years due in part to people becoming more health conscious and also the availability of produce. There are now thousands of salad recipes online. If you want to bring a seafood salad to your seafood picnic a quick google will lead you to the likes of this Italian seafood salad or this Vietnamese seafood salad. Personally I don’t think you need to follow a recipe for a salad, you know want you like, so just cut it up, mix it together and chuck it into a picnic container. This will often be better than adding ingredients you’re not overly keen on just to follow the recipe. 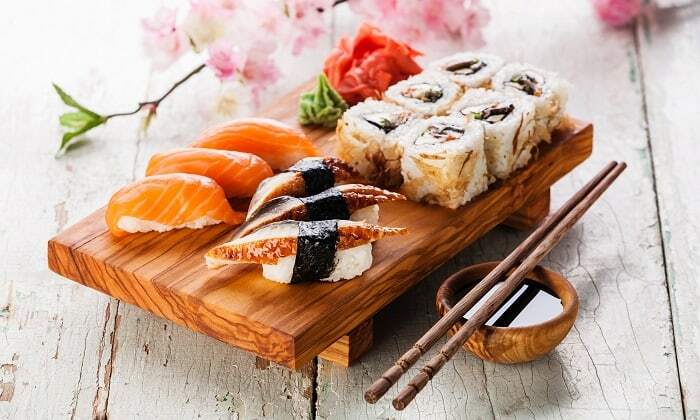 In Japan a single tuna fish sold for over $600k, while around the rest of the world tuna is the biggest selling fish product. Which is no surprise when you think how versatile tuna is. It tastes great in a salad, with pasta, on a potato or even between two slabs of bread with a dollop of mayo. So bringing tuna with you to a picnic is no risk. People love it, but at the same time your guests are also likely to have already eaten tuna that week. So do something a little different with a tuna dish, like making tuna samosas. 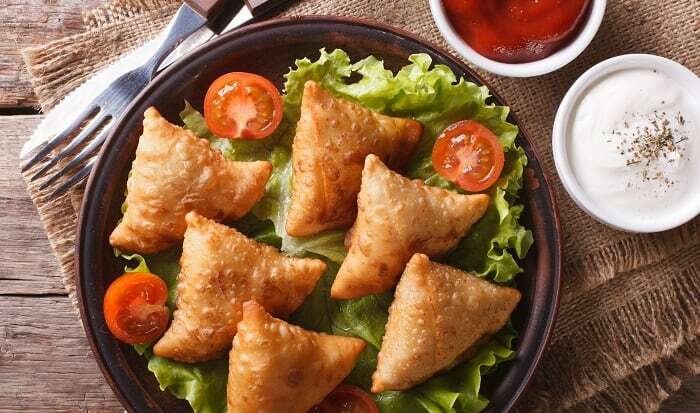 Tuna samosas tick all the right boxes when it comes to picnic food, as do many seafood dishes, it’s why seafood picnics are a great idea – samosas are shareable, tasty cold, easy to transport etc. Samosas are also very easy to make, see this recipe for example. You could have a batch of samosas ready in under half an hour. You can also mix it up a bit and make several different seafood samosas. I’m a big fan of smoked salmon samosas. You have your classic seafood soups such as clam chowder and Tom yum, then you have a host of different soups all going by the name seafood soups (which are basically chefs freestyling), and then you have your own personal favorites. I can’t see how you can ever go wrong with a Jamaican curried shrimp and mango soup. But one thing that’s common with all the great soups is they need to be served hot. If you have a good cold seafood soup recipe let me know in the comments, until then though I’ll stick to hot soups carried in my trusted picnic flask. A cold fish curry is definitely an option here, but I have decided to add a few dishes that involve bringing along some of the more dedicated picnicker supplies. In this case a portable picnic stove. Bringing a portable stove gives you the option to make the fish curry fresh in front of your guests, or just simply warm one you made earlier. I’m a bit of a show off so I like to make it fresh, and the great thing about fish curry is it’s pretty simple to make. Follow the steps from Jamie Oliver’s site and you can’t go wrong. Portable BBQs are no longer uncommon at picnics. It all started when people brought along disposable BBQs but now with great low-cost portable grills people have decided the upgrade to the superior option. And now having a portable BBQ available is slowly becoming standard for the seasoned picnicker. So if you have a BBQ to use what should you do with it? Grilled fish of course. What fish you grill is entirely up to you, but if you were coming to my seafood picnic there is a very good chance you’ll be getting grilled Swordfish.